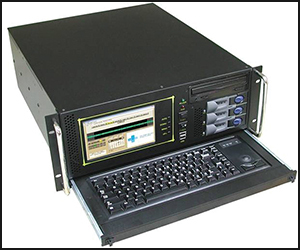 Sonifex can supply industrial rackmount PCs to run the PC-FLS8 Flashlog logging software. 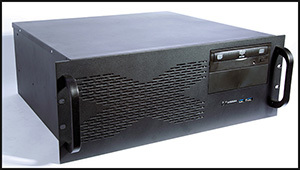 This is a rugged industrial 4U rackmount PC to run the PC-FLS8 Flashlog 8 software which has a front panel LCD display with a pull-out drawer for the keyboard and mouse. So, it’s completely self-contained and useful for secure logging environments. It has dual power supplies, 4 x PCI slots and 8 x PCIe slots. It uses an Intel i7 processor, has 8GB RAM, runs Windows 10 Professional and uses a reliable battery-backed Adaptec SATA RAID with 3 x 2TB Enterprise HDD. Finally there is also a DVD-RW drive. The 8 x PCIe slots allow this PC to be fitted with multiple PC-AD2, PC-DIG4, PC-AUR44, PC-FM, PC-AM and PC-DAB cards to produce a very powerful audio and radio capture logger. This is similar to the PC-RACK4D but doesn’t contain the integrated display and has a separate USB keyboard and mouse. It has dual power supplies, 7 x PCI slots and 5 x PCIe slots. It uses an Intel i7 processor, has 8GB RAM, runs Windows 10 Professional and uses a reliable battery-backed Adaptec SATA RAID with 3 x 2TB Enterprise HDD. There is also a DVD-RW drive. On this PC, there are 5 x PCIe slots which can be fitted with multiple PC-AD2, PC-DIG4, PC-AUR44, PC-FM, PC-AM and PC-DAB cards. This is a 1U industrial rackmount PC to run the PC-FLS8 Flashlog 8 software. It has a single PCIe slot so can only be used with one PCIe audio or radio capture card, ideal for logging up to 32 FM, or 32 AM channels or 4 DAB ensembles. It uses an Intel i5 processor, has 8GB RAM, runs Windows 10 Professional and uses SATA RAID with 2 x 2TB HDD. It also has a DVD-RW drive and separate keyboard and mouse. Please note that the PC-FLS8 Flashlog 8 software is not automatically included with these systems and must be ordered separately. Also, as is common with PC systems, the specification can change so contact Sonifex to check the latest product specs.